Hi just registered on here today, looks like a decent site. I am up in northern ontario in a small town, Loring. Self employed in tourism, 61, and now riding a 2005 bandit 1200s, my eighth bike, silver in colour completely stock except higher windshield, I hate. Too much wind noise. I am six foot, is this common? thinking of going back to stock windshield that came with bike too. love my bandit, soo smooth and fast...think I may be in for some speeding tickets. Too quiet may check out advice on slip ons. 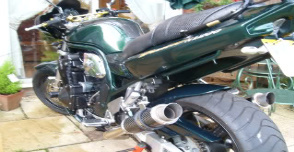 My last bike was the gsx1100g great bike but riding stance was wrong for me. Bandit is perfect. Later. Hey guys as I posted I am new on here and was really glad to find a site dedicated to bandits. But disappointed to put out a question and get not a single reply after 21 views. I guess it is not a real interesting pertinent subject matter but it is a concern I have and was/am looking to see if any others experience the same. Maybe I didn't word it correctly. I do find on windy days too my bike is affected by cross winds alot, could this again be the higher windscreen or just the half fairing? (I haven't had a faired bike since my 1984 EF 750), but maybe it's just me. Love to hear from you guys.